Welcome to the Cedar Bluffs Auditorium! The auditorium is located on main street in Cedar Bluffs and utilized for many different purposes. The auditorium includes two bathrooms, two locker rooms, a refinished gym floor, two basketball hoops, a full sized stage, and a kitchen. 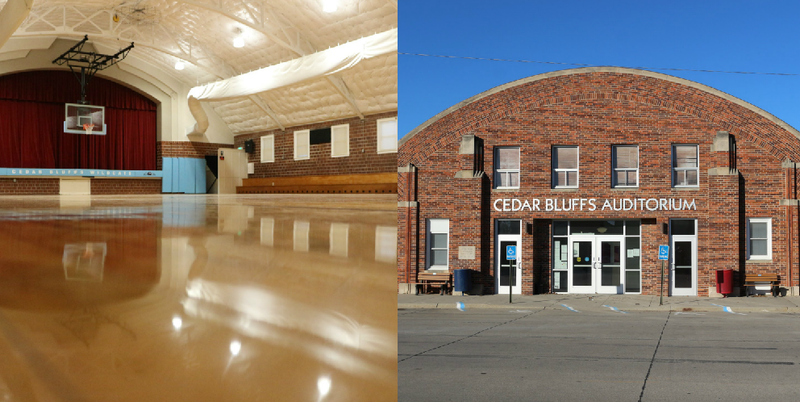 Cedar Bluffs Public Schools utilizes this facility for practices, community events, high school/middle school dances along with renting out this facility to members and groups in the community for personal use. The Cedar Bluffs Auditorium is also open to anyone outside of the community that is seeking space for a graduation reception, soup supper, meeting, birthday party, etc. This is a great facility to meet your needs!